To tell the truth...it doesn’t really matter if you lie. It’s impossible to lie to Derry MacKenna. For as long as she can remember, Derry has been plagued by the extraordinary ability to hear, see, and feel the truth. But when Derry and her erratic, self-centered mother move to historic Harpers Ferry, she discovers she is not the only one with hidden talents. As the newest reporter on the school newspaper, Derry learns of a high school student’s unexpected suicide and recognizes that the truth behind her death may still be hidden. When tragedy strikes, Derry is drawn into a deadly battle of wits with the only person whom her abilities don’t affect. Driven by guilt and an obsession with bringing the killer to justice, Derry finds herself in danger from a vindictive murderer, a sadistic deviant who preys on the weak, and trapped in the middle of a treacherous triangle of attraction between two brothers whose abilities rival her own. Derry must trust her instincts to guide her to the truth and bring her enemies to justice even as she fights for her own survival. INSTINCT focuses on a gifted, intelligent, and loyal heroine who must contend not only with the inherent dangers of high school bullying and backstabbing, but with loss, grief, and guilt. Against issues of sexual abuse, teenage suicide, and destructive relationships, the heroine learns to cherish the strength of real friendship, understand accountability, and experiences the healing touch of first love. Oooh! Intriguing! And I like the fact that it's set in Harper's Ferry. It's always nice to read about a location that you've seen before; it's much easier to imagine the surroundings. 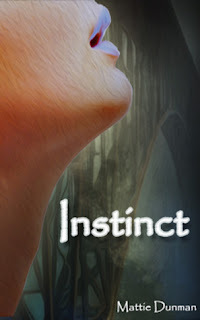 Read below for an excerpt of Instinct. The sign over the doors reads “John Brown High School.” I don’t see anything else because there isn’t any truth to conceal. The building is exactly what is advertised, and my nerves calm their ragged dance slightly at this reassurance. Taking a deep breath, I put my hand out and get ready to open the door. It swings open, nearly swatting me in the face, and I stagger back, almost tumbling down the stairs I just climbed. An angry looking boy in a black wool pea-coat and dark jeans stalks past me, not even glancing my way or noticing the way I’m cradling my arm where the door struck it. I consider saying something, but the hard set of his shoulders prevents me from forming words. I swallow my irritation and rub my forearm until the stinging passes. The boy runs down the stairs and halts before he crosses into the street. He glances around as though searching for something and then slowly pivots and locks his gaze on me. My chest constricts and I can’t breathe. An invisible hand is gripping my throat and deliberately tightening until my head is no longer connected to the rest of my body. The inside of my mind burns like molten lava being poured in my brain and my legs and hands start to shake uncontrollably until I almost cannot remain standing. Just as suddenly it stops and the vise on my neck is released. My mind clears with no residue of pain, as though the past few seconds never happened. I see the boy widen his eyes in surprise before he jerks abruptly and turns his back to me, crossing the pick-up lane and turning the corner, out of my sight. I am left breathless and stiff with terror. I don’t know how, I don’t know why, but I can’t help feeling that somehow that boy just nearly killed me with a look. Eleanor & Park: Third Time's a Charm?